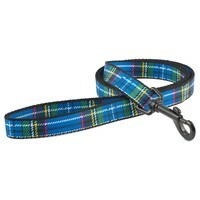 Ancol Nylon Tartan Dog Lead 1m is a fashionable accessory for Scottish breeds or for dogs who simply love tartan for its tradition and character. Strong, lightweight and weather-proof, the Ancol Nylon Tartan Lead has been made from printed polyester and nylon strapping that have been chosen for their durability and flexibility. Comfortable in the hand, the lead also features a sturdy metal trigger hook that can be easily attached to your dog’s collar or harness.